The Mimax Angle LED ceiling light is in a square design and a White finish. The Firstlight Arlo 4929 Single Light Ceiling Pendant has a Chrome finish inner mesh shade with a clear glass outer shade. The Firstlight Arlo 4930 Single Light Ceiling Pendant has a Chrome finish inner mesh shade with a clear glass outer shade. The Firstlght Art Deco 4947 Single Ceiling Light is in a Chrome finish with an Opal White glass shade. The Firstlght Art Deco 4948 Single Ceiling Light is in a Chrome finish with an Opal White glass shade. The Firstlght Art Deco 4949 Single Ceiling Light is in a Chrome finish with an Opal White glass shade. The Kolarz Ascot 0195.32.4 is in antique brass finish with a cream pleated shade and Murano glass detailing. The Franklite Aspen FL2396-1 is in a gold finish, resembling autumnal twigs. The Franklite Aspen FL2394-1 is in a gold finish, resembling autumnal twigs. The Franklite Aspen FL2395-1 is in a silver finish, resembling frosted twigs. The Franklite Aspen FL2393-1 is in a silver finish, resembling frosted twigs. The Oaks Ballon 4530/30 AB is in an antique brass finish with crystal glass beads. The Firstlight Bar 8613WH is a modern LED ceiling light in a White finish. The Mimax Beacon LED ceiling light is a modern, Chrome finish ceiling pendant with a White polycarbonate diffuser. The Firstlight Berkeley Single Ceiling Pendant is in a Black finish with an LED vintage filament lamp. The Firstlight Berkeley Single Ceiling Pendant is in a Brushed Steel finish with an LED vintage filament lamp. The Firstlight Berkeley Single Ceiling Pendant is in a Copper finish with an LED vintage filament lamp. The Firstlight Berkeley Single Ceiling Pendant is in a White finish with an LED vintage filament lamp. The Firstlight Bistro Single Ceiling Light is a modern Chrome finish ceiling pendant with an orange inside. The Interiors 1900 Brooklyn Tiffany medium acorn ceiling light pendant has bevelled and textured glass combined with rich cream art glass. The Interiors 1900 Brooklyn Tiffany small acorn ceiling light pendant has bevelled and textured glass combined with rich cream art glass. The Elstead Cadence 2 Light Ceiling Light Pendant is in a Dark Antique Brass And Matt Black finish. 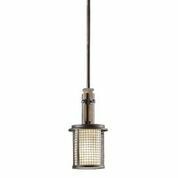 The Elstead Cadence Single Ceiling Light Pendant is in a Dark Antique Brass And Matt Black finish. The Elstead Cadence 2 Light Ceiling Light Pendant is in a Polished Nickel And Brushed Steel finish. The Elstead Cadence Single Ceiling Light Pendant is in a Polished Nickel And Brushed Steel finish. The Firstlght Cafe Single Ceiling Light is a Brushed Steel single pendant with a blue interior. The Firstlight Cafe Ceiling Light is a single light pendant in a Copper finish. The Firstlight Cafe Single Ceiling Light is a Brushed Steel single pendant with a green interior. The Firstlght Cafe Single Ceiling Light is a Brushed Steel single pendant with an orange interior. The Firstlght Cafe Single Ceiling Light is a Brushed Steel single pendant with a white interior. The Kolarz Calimero A1306.31.Wm.Cu/45 has a hand decorated Copper leaf inner surface. The Kolarz Calimero A1306.31.Wm.Au/45 has a hand decorated Gold leaf inner surface. The Kolarz Calimero A1306.31.Wm.Ag/45 has a hand decorated Silver leaf inner surface. The Kolarz Calimero A1306.31.Wm.SunCu/45 has a textured Copper handpainted inner surface. The Kolarz Calimero A1306.31.Wm.SunAu/45 has a textured Gold handpainted inner surface. The Kolarz Calimero A1306.31.Wm.SunAg/45 has a textured Silver handpainted inner surface. Luxury Lighting offer a vast selection of single pendant lights for your home. These are available in various finishes and styles to suit you. This style of single ceiling pendant lighting has become a very popular choice for rooms in the home with designs ranging from the stylish and sleek to the retro and urban.